Budapest, Hungary - The Gamma Project has announced that they are dropping iSyslog's price for a limited time, effectively immediately which will reduce the app's price from $1.99 to $0.99. 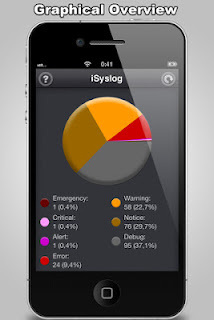 iSyslog is a tool for users and professionals interested in the overall health of the apps and processes running on their iPhones, iPod touches and iPads. Polished and easy-to-use, the app helps both end users and experts to check out what's going on under the hood on their device; one can easily detect bugs, analyze apps' sanity and report issues - without having to be an iOS expert. iSyslog retrieves and visualizes all messages generated by apps and processes, which otherwise would remain hidden. The information is presented on a polished, intuitive interface, which requires no instructions for use. After starting the application we get a comprehensible overview of all apps and processes which have generated log messages. Pie-charts and graphics provide an intuitive way to quickly check the sanity of your system. By pulling down the main view an analytical view is shown, which presents a graphical overview of all the messages being generated grouped by severity. Back to the main UI, we can unfold each and every process or app section, and take a closer look at the messages belonging to them. You don't have to be an iOS developer to quickly spot errors: intuitive graphics and dedicated colors help finding the relevant entries. Whenever an app is crashing, we usually can't do much - except maybe contacting the developer, and trying to describe the problem. However, this information is usually not enough to find the root cause and solve the issue. iSyslog can be of great help in this case: you can easily spot the relevant log entries, and allows copying their content to the pasteboard, or sending the logs via e-mail to the support staff. With iSyslog you can quickly identify the faulty process and its log entries, including the detailed call stack information - which is vital for developers to fix the problem. Messages can be copied to the pasteboard or sent one by one via e-mail. You can e-mail as a zipped attachment all messages generated by a given app. A useful feature: the device type and the iOS version is automatically inserted in the e-mail body (these data can be very important to developers or support personnel). "Whether you are a user who cares about what's going on behind the scenes on your device, a developer who wants to ensure his app is working as expected, a support specialist or a test engineer looking for bugs in a specific software, iSyslog was made for You. Enjoy!" - stated Developer Karoly Nyisztor. iSyslog 1.2.1 is $0.99 USD (or equivalent amount in other currencies) for a limited time and available worldwide exclusively through the App Store in the Utilities category. Based in Budapest, Hungary, the Gamma Project team is a small software independent company founded by Karoly Nyisztor. With their strong blend of design and development skills, Gamma's passion is to craft quality 3D games and applications for the iPhone. Copyright (C) 2004-2012 Gamma Project. All Rights Reserved. Apple, the Apple logo, iPhone, iPod, and iPad are registered trademarks of Apple Inc. in the U.S. and/or other countries.